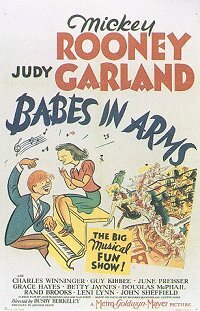 Knowing that a storm visitor was a fan of Judy Garland, I picked out Babes in Arms from the On Demand list, and wound up watching it myself. I did that because this 1939 film was based on a 1937 Broadway musical by Richard Rodgers and Lorenz Hart. I’ve always been curious about that show, but I’ve never seen it produced on stage. I knew well before the movie was over that the stage show has to have been better. This was one of the “let’s put on a show” movies that Garland made with Mickey Rooney. It turns out that it was only loosely based on the Broadway show. In fact, I have since read that once the brains at MGM got the rights to the show, they made wholesale changes to the script and threw out all the songs except the unmemorable title song and the memorable “Where or When,” which was introduced on Broadway by Ray Heatherton (who later had a long run on television as the “Merry Mailman”) and Mitzi Green. That means, that MGM — specifically producer Arthur Freed — cut “My Funny Valentine,” “I Wish I Were in Love Again,” “Johnny One Note,” and “That’s Why the Lady is a Tramp” (which is heard only as incidental background music). Freed added two old songs of his own — “I Cried for You” and “You Are My Lucky Star” — and he and Nacio Herb Brown wrote “Good Mornin'” especially for this movie. E.Y. Harburg and Harold Arlen, who had contributed three classic songs to The Wizard of Oz, were employed on this movie to write “God’s Country,” a heavy-handed finale that was influenced by the war under way in Europe. This film was directed by Buzby Berkeley in an era when the canteen didn’t stock de-caf coffee. It is, in a word, exhausting. 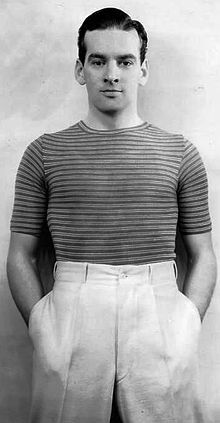 The production numbers with their quick-step marches are dated and Rooney in particular, as talented as he is, is manic — a fault that is made more conspicuous by the fact that Garland’s performance is comparatively understated. Apparently there was some racially insensitive material in the Broadway production, and there is an offensive minstrel sequence in the movie. 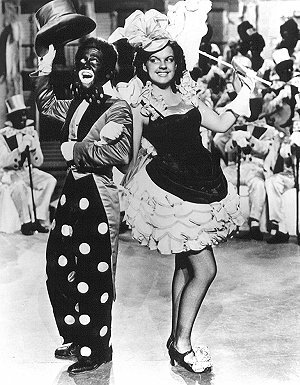 Blackface was common into the 1950s; in fact, when I was a kid, my parish used to stage annual minstrels complete with end men in burnt cork exchanging idiotic banter with “Mr. Interlocutor.” It’s as hard to watch now as it should have been then. I’ve read some attempts to rationalize this display, including one argument that the caricatures were mild, but there is nothing mild about Rooney’s lampooning in particular. He’s Jolson in overdrive. There is a clever number in which Rooney and Garland do good-natured send ups of Franklin and Eleanor Roosevelt. This scene was cut from copies of the film distributed after FDR died in 1945, but it has been restored and is one of the most worthwhile things in the movie.